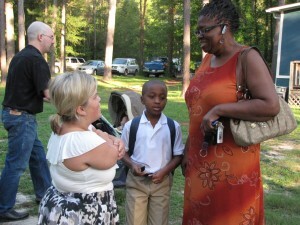 Parents Ryan and Tina Tinkle help kindergarten student Hayden Tinkle arrive for the first day of classes at Charter Day School in Leland NC. Charter school in Leland, NC starts anew with a successful year-round schedule. (Left to right) Student Isabel Beadore, Teacher Joy Barth, Mattie Tharp and Taylor Reece pose for the start of the new school year at Charter Day School in Leland, NC. Students hopped, skipped and jumped to Charter Day School in Leland to start their new year with the first day of classes on Monday, July 18, 2011. Tears, smiles and hugs were seen as proud parents, excited students and smiling teachers settled in to the first day of school. Charter Day School is a year-round school and classes start earlier in the summer but have longer breaks throughout the year. The school says their experience has shown that academic skill retention is higher with shorter summer breaks and a year-round schedule. There are still student spaces available for this year in second grade, fifth grade and middle school – contact the school at 910-655-1214 for admission. Teacher Katie Coleman greets returning student Quantico Fennel and Sharon Everette on the first day of school at Charter Day School in Leland. The Roger Bacon Academy – Charter Day School is a tuition-free, open enrollment public school in southeastern North Carolina. Since 2000, Charter Day School has focused on quality K-8 education and is a premier performance-driven year round school. Widely recognized as a compelling choice to conventional public education, the school has built a reputation for dedicated and highly qualified teachers that give students a strong and proven academic foundation. Charter Day School has received numerous awards, including the designation of being a Top-25 School for Academic Growth and Excellence in the state of North Carolina. 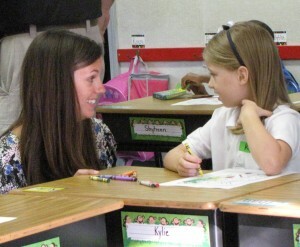 Kindergarten teacher Brianna Cox brings a smile to new student Kylie Cochrane on her first day of school at Charter Day School in Leland, NC.